Thomas Earl Petty (October 20, 1950 – October 2, 2017) wis an American rock muisicker, sangster, sangwriter, multi-instrumentalist, an record producer. 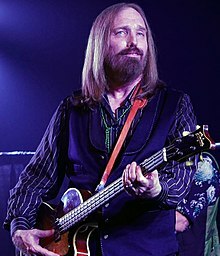 Petty served as the lead sangster o Tom Petty and the Heartbreakers. ↑ Erlewine, Stephen Thomas (2006). "Tom Petty - Biography". AllMusic. Retrieved April 12, 2008. This page wis last eeditit on 9 October 2017, at 17:04.